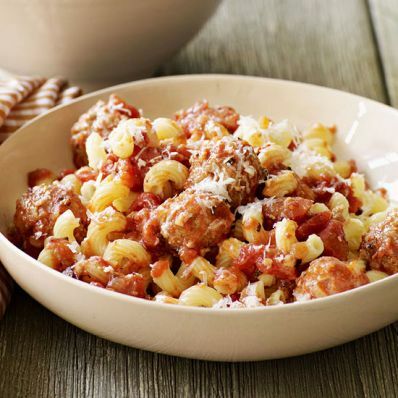 1 of 4 In a large bowl, combine sausage, bread crumbs, milk and Italian seasoning. Form into 36 meatballs. 2 of 4 Heat a large nonstick skillet over medium heat and coat with nonstick cooking spray. Add onion and garlic; cook 3 minutes. Stir in diced tomatoes and tomato sauce; bring to a simmer. 3 of 4 Add meatballs to sauce. Cook, covered, on medium-low for 5 minutes. Turn meatballs and cook an additional 5 minutes. Meanwhile, cook cavatappi as per package directions, about 8 minutes. Drain, reserving 1 cup of the pasta cooking water. 4 of 4 Spoon meatballs and sauce plus reserved pasta water over pasta. Sprinkle with cheese, if desired. Serve with Radicchio and Shaved Fennel, if desired. Per Serving: 623 mg sodium, 5 g fiber, 1 g sat. fat, 0 mg chol., 6 g Fat, total, 77 g carb., 25 g pro., 472 kcal cal.